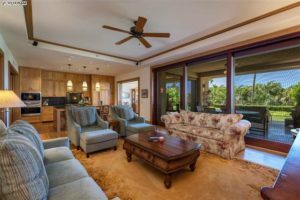 Just brought to market, Montage Kapalua 5103 is a desirable ground floor unit located in Building 5 which offers convenient access to Kapaua Bay and the community club house. Just off the back of the villa is a 551 sqft covered lanai that can function as a 2nd living area, focal point with guests, and the outdoor bbq area. With multiple floor to ceiling doors, plenty of natural light flows throughout the making it feel bright and airy. While on the first floor, the villa contains a private 3 bedroom layout plus a den for a reading or study area. Although the units can be rented out on a short term basis, it has been primarily used by the owners and not rented out through the rental pool. A lush garden backs right up onto the lanai and offers your own peace of paradise. 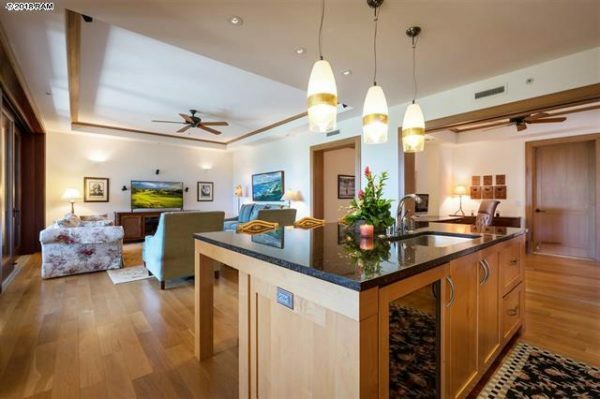 Unique features of this Montage Kapalua residence include extensive use of the highest quality wood flooring and easy garage access to a tandem parking space and owner storage. 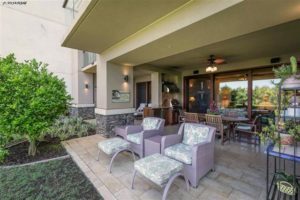 Ownership of this lovely residence will include access to all Montage and Kapalua Resort five-star amenities including two golf courses, tennis facilities, numerous restaurants and the resort shuttle. With 11 units sold through 9 months, the Montage Kapalua is looking like it will have a strong year with $54 million sold in running sales volume. The majority of the sales have come in the summer months, with on and off production. So far May has been the most productive with 3 units sold, while June and August have each seen 2 units sold. Currently no units sit in escrow and is in a rather slow period until visitor season picks back up towards the latter half of November. Enjoying the Kapalua lifestyle doesn’t come cheap and buyers will certainly have to fork out hefty premiums to enjoy the relaxed and vibrant lifestyle. On the lower end of the market, buyers are forking out $3.5 million + a $4000/month maintenance fees for 3 bedroom units; in terms of price/sqft, buyers should expect to pay around $1250. On the upper end of the market, 1 buyer paid just under $9 million to secure the most expensive condo sold this year in Montage. The Montage Kapalua market is on par with the Wailea condos for sale and is even more prestigious than some of the Wailea complexes. To get a better idea of the market, check out our Montage Kapalua sold data. With over $35 million in inventory, Montage Kapalua Condos For Sale is a rare opportunity to buy into West Maui’s most coveted condo development. Ran in conjunction with the Montage brand, buyers receive access to all Montage properties across the nation. Currently, the market is weighted more in favor of the lower priced units; although priced around $3 million, buyers still need to be able to afford the steep monthly maintenance fees of around $4000 for some of the smaller units. Since the beginning of September, only 2 units have come to market. 5 other listings have come to market since May, with the remaining 2 being listed in late 2017. The current inventory is predominantly in the $3 million range with it representing 66% of the available units for sale.